January has been a fun month doing lots of activities with family and friends. Typically, I am NOT a “crafty” person. I’m a quilter. Now, that said…it’s been a crafty kind of week! 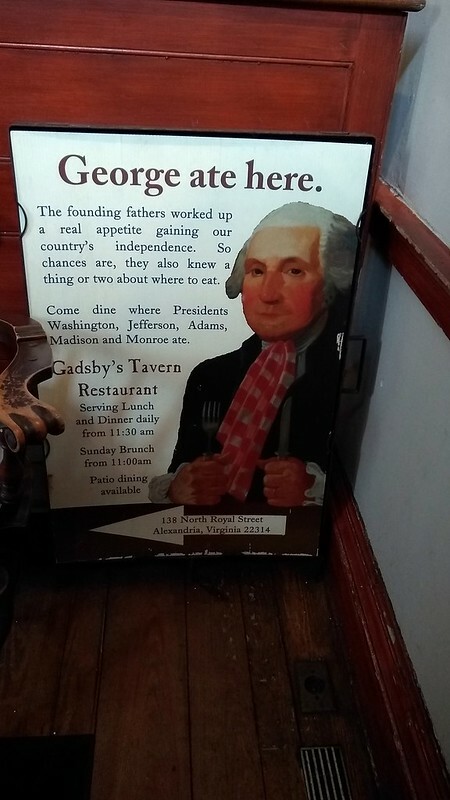 I took a trip over to Alexandria VA last weekend to participate in the “MAKER’S MILE” in Old Town Alexandria. This event was sponsored by Fibre Space, Penny Post, Stitch Sew Shop, Red Barn Mercantile and A/R Workshop. 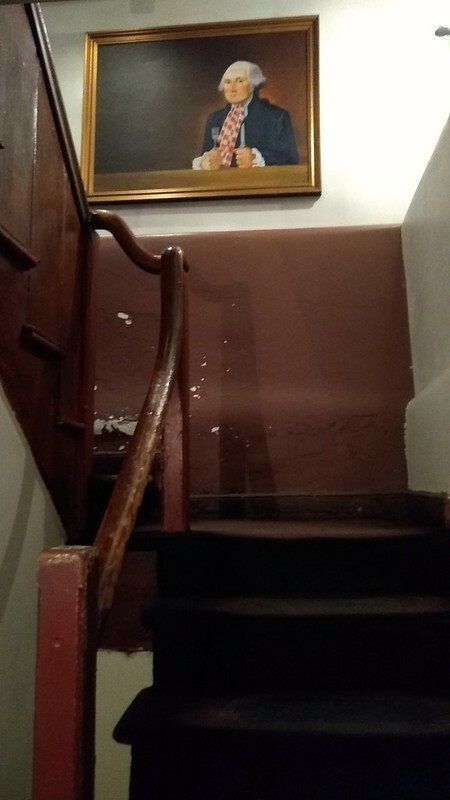 For a modest fee, we attended “maker’s workshops” at each shop, and made a small project. We started at Penny Post, which is a delightful stationary shop. Our project was to “decorate” a small notebook. 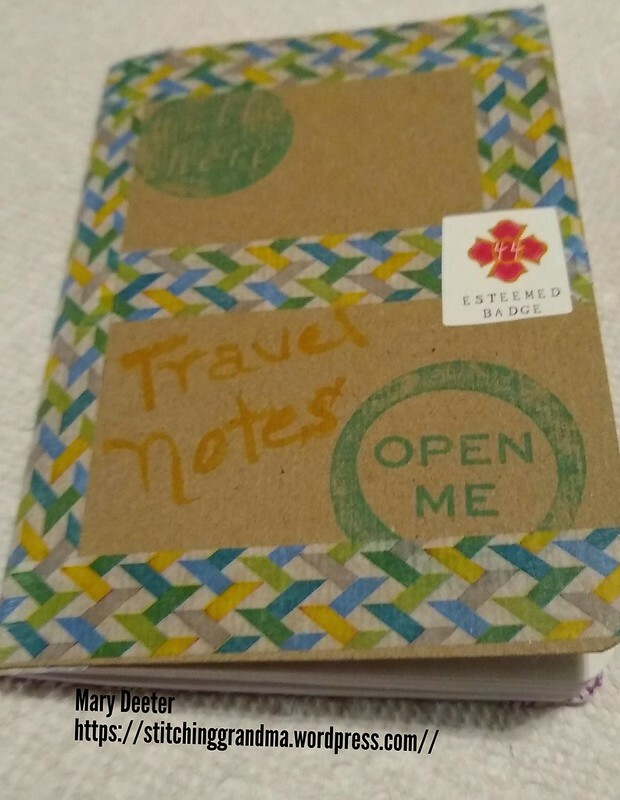 Materials were all provided and we had fun trying out new stamps, fun pens, washi tape etc. Our next stop was Red Barn Mercantile, where we created cute little beaded necklaces. This project was fun until the end, when pliers were needed. After a lengthy search for them, the clerks finally appeared with a set. Couldn’t have finished without them to put the last bead on! 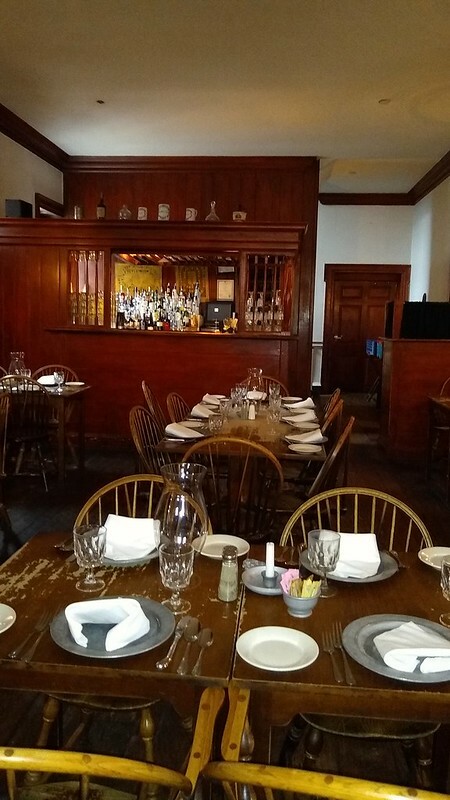 We followed that project up with a nice lunch at a rather historical location – Gadsby’ Tavern Restaurant. We walked off our lunch by heading to A/R Workshop. There we selected our “inspiration word for 2019” and did a little painting. This shop was a little more “hands on” helping with the project. Heading back to the other end of the Maker’s Mile, we road the free trolly through Old Town. We hopped off and walked a few blocks to Fibre Space, a lovely shop full of yard and patterns and nice people. There certainly a lot of knitters working on projects in the store and the knitter I was with went shopping while I attended the workshop and 3 youngsters. 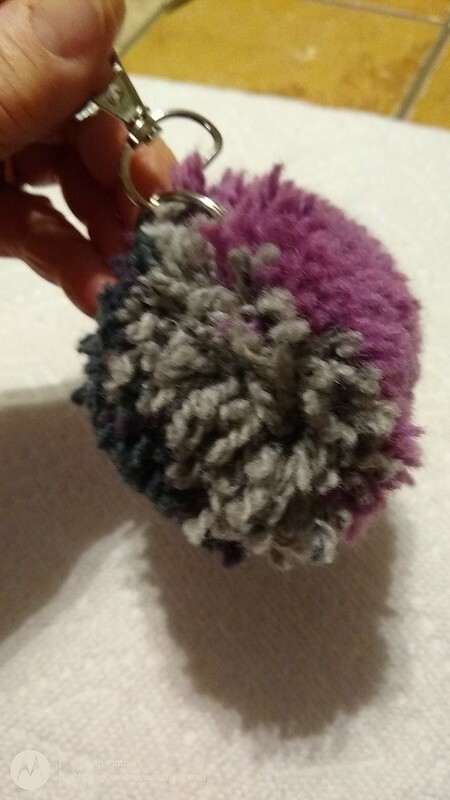 Everyone got their pom-pom key ring made, and it was probably the most “hands on” of the projects thus far. Last stop was Stitch Sew Shop – where the task was a counted cross stitch item. We were given a kit, told to select to contrasting colors of embroidery floss, then left to our own devices to get the needle threaded etc. (I gave up after 3 tries…no needle threader, 6 strands of floss and standing to work on the project.) Into my bag it went, and I intend to try it at another time. 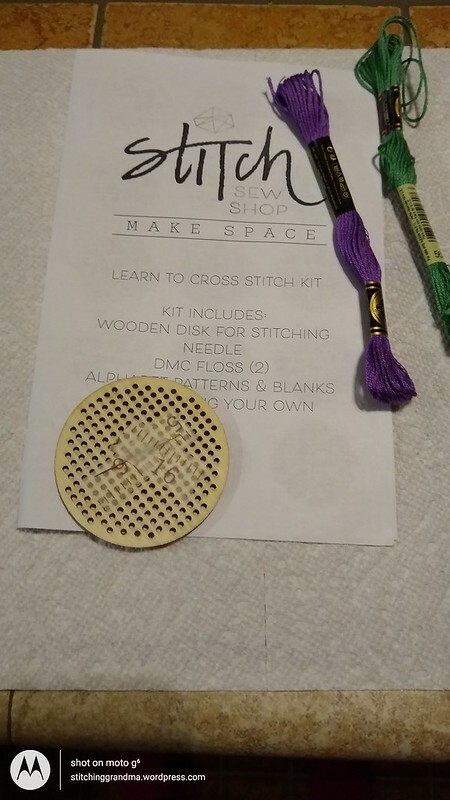 I was startled to find no needle threader available on the notions wall in a sewing store. The shop was very crowded, as we arrived in the first hour they offered the activity. I watched a “sewer” working diligently on a project bag while there were 25 people crowded around the table next to her. KUDOS to her for her concentration. Is it a UFO if you never started??? I’ll take it on my trip tomorrow and see if I can do something with it! At home this week, I had a Bee on Tuesday, Second Time Around on Wednesday, and today, after packing for my trip tomorrow, I took some time to do a test run of a project I have planned for February. 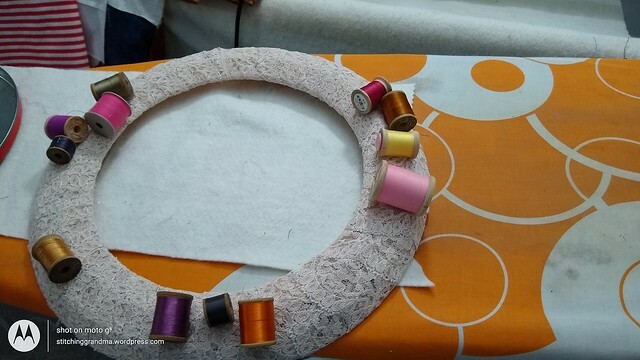 I made a wreath for my sewing room wall. I started with a wire frame from Dollar Tree, then wrapped it in pale pink lace. 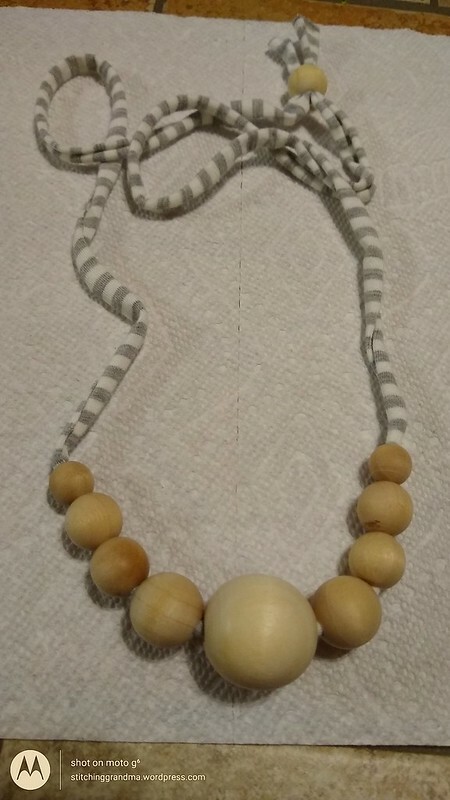 I got out the hot glue gun and all those old wooden spools of thread from the bins of “unsold stuff” at Second Time Around. I trimmed and glued and and kept piling on things until I was satisfied with the results. I think it worked out pretty well, and I can’t wait to hang it on the wall in my sewing room. But first, I am going to use it as a sample when my Queen Bee friends come over and they work on their own wreaths. Plus, I am going to “borrow” their back, and use it as a display during our quilt show. I think I am going to assemble some “KITS to make your own wreaths” and sell them at the quilt show. in the Second Time Around Booth. 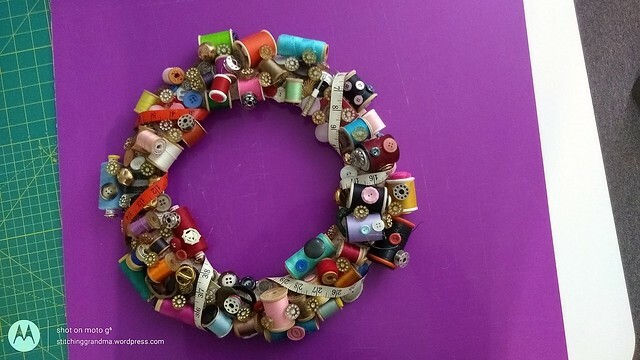 We have an ABUNDANCE of supplies, like old buttons, notions, thread etc, and this seems like the perfect solution. (My daughter said to me recently that if I had a “sample of a craft” they could get inspired! Here’s my sample. So, that’s all the crafty stuff for now. No sewing, but a lot of fun. I’ll be off on a trip for the next week, but I am taking my English Paper Piecing hexies with me and that counted cross stitch project too. 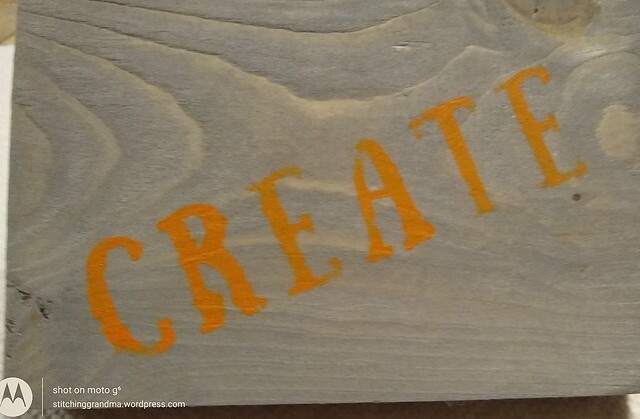 What’s happening in your crafty world?